Your customers - both existing and potential alike - rely on social media to stay relevant in their social circles and meet neighbors, friends, and those that share their interests. You should follow suit and make a brand that's approachable, interesting, and unique to capture and hold their interest. Being active on social media allows you to engage and nurture leads in real-time. What effect does winter have on a customer's lawn and soil conditions? What type of ice-melt products are safe for use near greenery? What can your company do to help them prepare their lawn for spring? You can also post your own before-and-after lawn photos, share quick tips, promote discounts and share customer testimonials. Ask current customers for reviews. The ideal time to ask would be as you're settling the invoice with a customer pleased at your recent work. Otherwise, you can reach out to existing customers with a postcard or an email offering a discount on their next service in return for their honest review. Be calm, cool, and collected. No one likes to hear bad things about themselves, even less so if those bad things simply aren't true. However, it's extremely important to remember that the "internet is forever." A bad-mannered response to a negative review may deter potential customers from contacting you for business in the future. Avoid canned responses. In this case, it’s more impactful to give a personal response to online reviews. 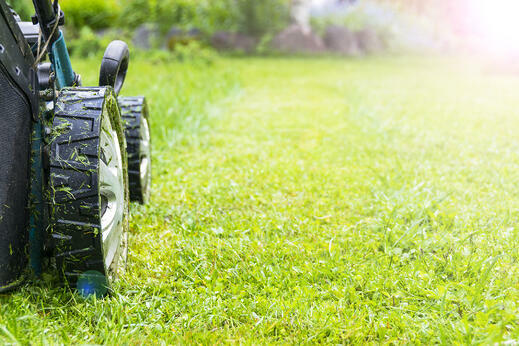 Remember, your potential lawn care clients will be scanning a list of reviews, so the same answer popping up over and over will come across as robotic and uncaring, rather then warm and attentive. Help your customers achieve a common goal: a lush, beautiful lawn they'll enjoy and take pride in. Offer to educate them by sharing helpful lawn care advice through blog posts, videos, social media content and other digital media. Doing this will help to position your business as a trusted resource - increasing the chances that lawn care customers will contact you when they need your services. For example, you can create short videos that demonstrate how to aerate the lawn or how to identify the best cool-weather grass seed. Another option is to create a short blog series such as “John Doe’s Green Thumb Hints,” and write a short social media post to tease each one. Using your blog and social media channels to share your expertise will help reinforce your brand and foster more engagement. To be effective, incorporate natural calls-to-action (CTAs) throughout every piece of content encouraging users to take the next step and contact your lawn care business for more information or to schedule a service. Your existing customer base is a gold mine for your lawn care business, especially since it costs five times as much to attract a new customer than to keep an existing one. During the off-season, be diligent about keeping these customers engaged and connected to your business. You can offer ongoing maintenance services, upsell your services, offer an early-bird discount or simply check in on former customers by phone or email. The ultimate goal is to turn one-time customers into repeat customers to maintain sustained growth - even in the winter months. Digital advertising, be it social media ads on Facebook and Twitter or more display ads, can boost the results of any marketing campaign. More specifically, it’s a great tool for building brand awareness, targeting certain customers and driving a specific action such as scheduling a lawn service. What’s more, if you can meet your customers' needs with a solution in the moment they're searching for it, you’re more likely to receive their business. Simply put, there are certain customers looking for you right now, and digital advertising helps you connect with them. Decide on a budget - whether it’s per campaign, per day or per platform - and stick to it. Determine what type of ad will work for your message. Would a video or image-heavy ad be most effective? Don't waste resources. Decide what metrics will be used to measure an ad or campaign's success, and check them often. Don't let your lawn care leads lay fallow in winter just because the greenery does. Much like plants, those leads can be cultivated during the off-season and encouraged to take customer action during the warmer months. Take this valuable time to implement the strategies above and grow your lawn care business year round.